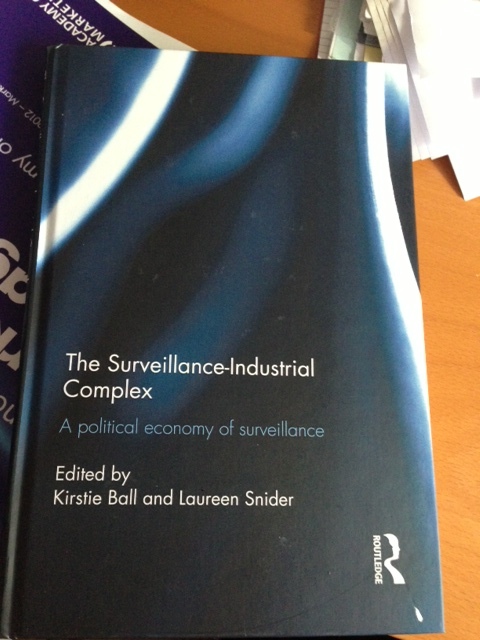 Recently, I received in the post a copy of the book ‘The Surveillance Industrial Complex – A political economy of surveillance’, edited by Kirstie Ball and Laureen Snider. In this book, long term collaborators, Kirstie Ball and Lauren Snider examine the nature of today’s surveillance structures. They note that not only is surveillance conducted at a mass scale, but also it has assumed ‘legitimacy’ as part of the discourse of national security. Moreover, it is noted that commercial organisations play a key role in enabling that surveillance. Today’s ‘surveillance society’ emerged from a complex of military and corporate priorities that were nourished through the active and ‘cold’ wars that marked the twentieth century. Two massive configurations of power – state and corporate – have become the dominant players. Mass targeted surveillance deep within corporate, governmental and social structures is now both normal and legitimate. how local political economies shape the deployment and distribution of the massive interactions of global capital/military that comprise surveillance systems today. This volume will be useful for students and scholars of sociology, management, business, criminology, geography and international studies. I contributed one chapter to this book. My chapter is entitled ‘Critical examination of the role of private actors in the fight against money laundering: the case of the UK retail banking industry’. The process is characterised by uncertainty and ambiguity. This book has been several years in development. Yet, I think that it is more relevant than never, as shown by recent revelations of the US government’s extensive surveillance programme. It is not an easy read, but it is still an important one.